A chemistry degree and promising future, serene beauty and a simple family are the cornerstones of young Alex’s life. But when the twenty-three year old Colombian woman experiences heartbreak after her boyfriend leaves her, decides to set out for Europe. An uncertain job offer and 1,000 Euros are all that accompany her on her journey but as soon as she sets foot on Spanish soil, her hopes turn into a nightmare. She is taken to a brothel where she must prostitute herself in order to pay back the money she was loaned to travel to Spain. This is the traitorous web which supports the international traffic in women and drugs. Beaten, raped and insulted, Alex promises to herself that she will escape from her hell alive and get revenge for the humiliation both she and her friends suffer every day. During her flight, the protagonist will find herself caught once more, this time in the web of international spies and terrorism. But the help of a policeman and a paparazzi journalist investigating the sectarian world of bikers will be key to helping the woman to survive and unmask the people truly behind her ordeal; rich socialites and internationally renowned politicians. An unforgettable tale of female vengeance that also reveals the tangled paths of horrific multinational networks. 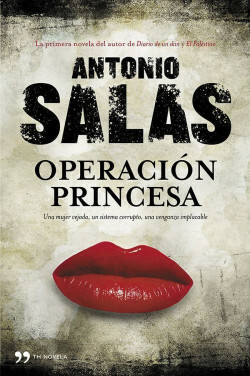 In this story, Antonio Salas, reveals everything he was unable to say in his non-fiction work. The novel includes details about all the social sectors in which the journalist is still active: espionage, prostitution and terrorism. Planeta Manuscrito (Portugal), Wydawnictwo WN (Poland).